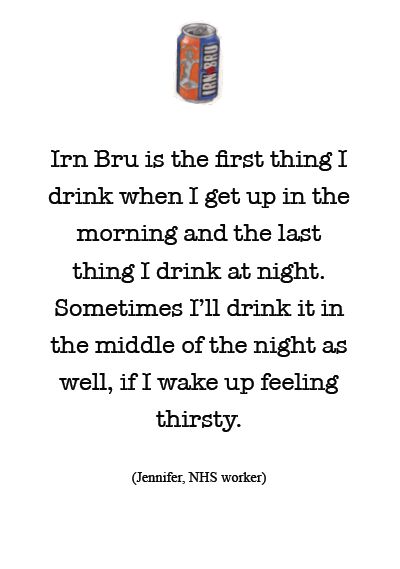 It is well-known that Scotland is the only country in the world where Coke is NOT the most popular soft-drink, but journalist Deedee Cuddihy had no idea how passionate people were about Irn Bru until she started research for "I Love Irn Bru." As she discovered, many people have an actual addiction to Scotland's other national drink, with some even admitting to feelings of anxiety and disorientation when separated from their beloved 'Bru. 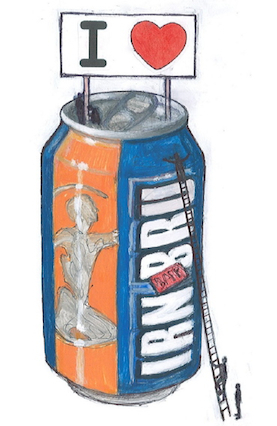 Illustrated with original photos, "I Love Irn Bru" features more than 100 first hand testimonies from Irn Bru drinkers, as well as borrowings from the internet and print media. Everyone in my family drinks Irn Bru with their meals, except my gran. She only takes it with vodka.